When does this crash happen exactly? E.g. does it happen when loading the files, or when saving? Also want the log above taken when an actual crash had happened? The crash happens during file loading. The log above is from after opening Picard again after the crash. During the crash, Picard freezes and I’m not able to copy the log. Is there a way to get it during the crash? Which exact release are you working on when it crashes? 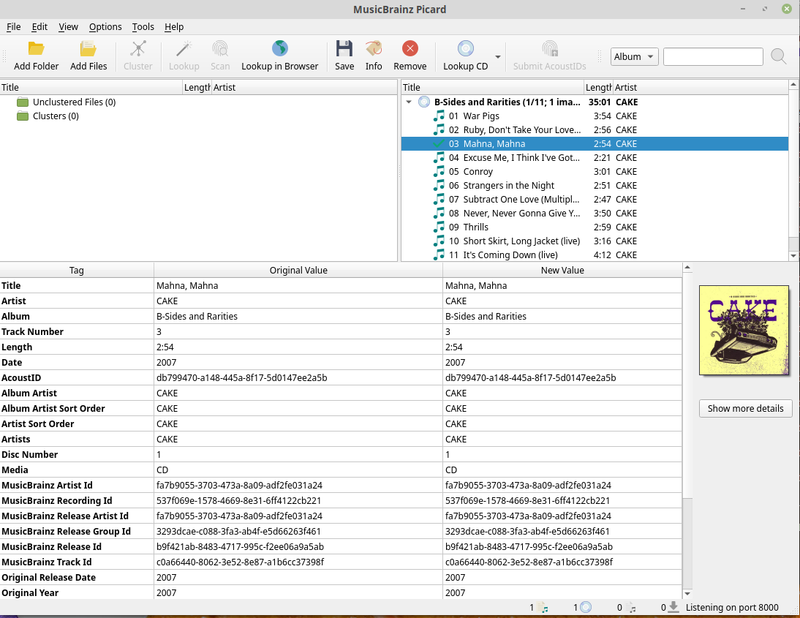 There are many types of art at MusicBrainz: from tiny 600x600 JPGs of a few KB up to huge 20MB PNGs of 3000x3000 and larger. I am able to select several individual songs, meaning I select ONLY that song and it will crash Picard so I don’t think the size of the album art even if it is 100MB is causing me to not have enough memory. I took this screenshot since I am not able to copy the text while it is frozen prior to crashing. I didn’t say anything about memory. I was aiming to assist by looking at the artwork angle. You are stating yourself that this only crashes when Embedded Artwork is selected. When that option is not selected then you said you are not getting an issue. I understand now. I thought you were referring to memory because all the forum posts I’ve found say that it is memory. And that’s right, it is ONLY when embedding cover art. Additionally, I have selected to ‘Only use images of the following size: 500px.’ Not sure if that’d be relevant. Ideally would help if those files causing trouble could be uploaded to a file share or wetransfer.com so we can try to reproduce this. Very relevant if you changing this on \ off is the difference between crash or not. Also note - only test with a small number of files. Ideally just the one. Does it still freeze? When it freezes, how long do you leave it? Walk away for ten minutes and then return later. Has it unfrozen when you return? The idea is the more you narrow it down, the more likely it can be reproduced by someone else, and then the bug found and fixed. I select just one file. It freezes for 4-7 seconds then crashes. I’ve tried kicking this around on a couple of Windows PCs and there is no problem appearing yet. Tried various combinations of embedding the image. Different sizes. Different options. Can’t get any freeze from this file. I notice that the actual release doesn’t have any images attached, but the Release Group does. Nothing that special there though as they are just normal JPGs. Multiple front images, a bit slow to download, but nothing odd. It is also interesting to see it was already tagged with MBIDs inside. Which would usually imply the tags had been done by Picard in the past. Isn’t 7mb a little heavy for a 2 1/2 minute mp3? Is there something else in the file? I was hoping others would have issues as well. 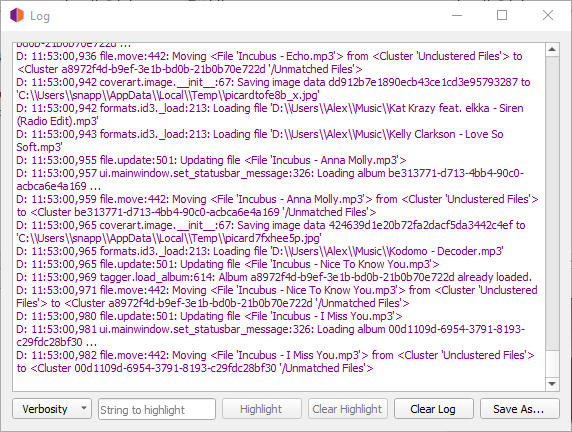 I’ve attached a screenshot of the debug log from this one song being added. Previous screenshot was of adding my whole collection. As far as the current tagging, I have tagged my collection in the past. Not that big. 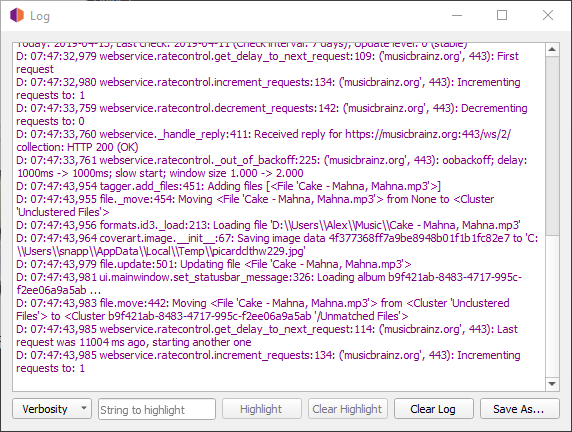 I tend to avoid MP3, but sitting in my same test folder is another 320kbps track that is 5mins 31secs and 12.7MB. So seems 7MB is not too weird for 3mins. This should mean the file is even more compliant. If the last tagger to write tags to this file was Picard then the tags should all be clean. I have two additional songs I’ve identified as causing me issues. Again, I’m fairly certain I’ve tagged these before. Interesting to note, they are both from the same album.